Every developer knows that adding indexes to database tables may speedup database queries. However, in several circumstances, this may not be the case, and your application may actually get slower when you add indexes. alternative solutions to optimize MySQL based applications without adding indexes that could slow down your application. All developers know, or at least should know, that adding indexes to tables may make queries execute faster. They also should know that in some cases adding indexes may also make the application queries run slower. So it happens that less experienced developers add table indexes when they shouldn't, as well others do not add indexes when they should. The video below gives you more detailed criteria for you to determine when you should add and indexes or not. In the second part it covers a more difficult case which is when you need to speedup a database application but you cannot add indexes because those would make the application slower. For this case, several solutions are presented that can help you to optimize your MySQL database application without needing to add indexes. At the time of this writing the second part of the talk video is being edited, so if you want to be notified when it is available, signup below the video using your Facebook account (faster notifications) or using your email, so you get a notice when it is up. This short video talk is the first of an initiative to spread the knowledge of experts that understand about performance optimization of applications that use PHP and related technologies. In the mid-term the idea is to gather experts that can provide support and produce the content of tutorials and slides of the talk presentations and be paid for their contributions, so they feel encouraged to spend more time sharing their knowledge with less experienced developers. If you want to join this Performance Optimization community, also signup below the video with your Facebook account or by email, so you are notified about new video talks and the get the next steps for those experts that want to contribute in the future. 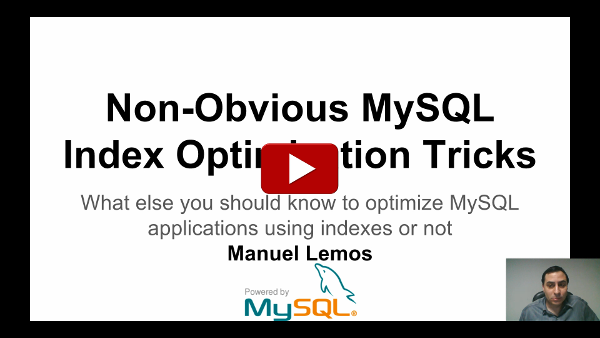 Video of the Talk "Non Obvious MySQL Index Optimization Tricks: part 1"